Elsevier Updates Major Reference Work, "Encyclopedia of Spectroscopy and Spectrometry"
CAMBRIDGE, MA--(Marketwired - October 24, 2016) - Elsevier, a world-leading provider of scientific, technical and medical information products and services, today announced the publication of the third edition of its major reference work, Encyclopedia of Spectroscopy and Spectrometry, edited by John Lindon, George Tranter and David Koppenaal. The updated work provides authoritative and comprehensive coverage of all aspects of spectroscopy and closely related subjects that use the same fundamental principles, including mass spectrometry, imaging techniques and applications. It includes the history, theoretical background, details of instrumentation and technology, and current applications of the key areas of spectroscopy. Elsevier also announced five other new chemistry and chemical engineering books. 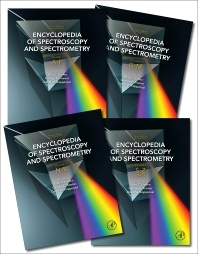 The third edition of Encyclopedia of Spectroscopy and Spectrometry includes more than 80 new articles across the field, complementing those from the previous edition, which have been brought up-to-date to reflect the latest trends. Topics covered in this edition include atomic spectroscopy, electronic spectroscopy, fundamentals in spectroscopy, high-energy spectroscopy, magnetic resonance, mass spectrometry, spatially-resolved spectroscopic analysis, and vibrational, rotational and Raman spectroscopies. Learn more about the Encyclopedia in this blog post. Dr. John Lindon is a professor and senior research investigator in the Division of Computational and Systems Medicine, part of the Department of Surgery and Cancer, Imperial College London, UK. He is also a founder director of, and a consultant to, Metabometrix Ltd, a company spun out of Imperial College to exploit the commercial possibilities of metabolic phenotyping. Dr. George Tranter is a director of Chiralabs Ltd., a company he co-founded in 2002, focusing on investigative R&D and analysis of materials and phenomena ranging from drug substances and chemicals through to engineering components, industrial processes and consumer products. Dr. David Koppenaal is chief technology officer at the Environmental Molecular Sciences Center (EMSL) at Pacific Northwest National Laboratory in Richland, WA. His research interests include the development of new instrumental and spectroscopic techniques for metallomics applications and the metallomic study of cyanobacterial systems. Elsevier announced the publication of the third edition of its major reference work, "Encyclopedia of Spectroscopy and Spectrometry," edited by John Lindon, George Tranter and David Koppenaal. The updated work provides authoritative and comprehensive coverage of all aspects of spectroscopy and closely related subjects that use the same fundamental principles, including mass spectrometry, imaging techniques and applications.